MONO JAPAN is a celebration of contemporary Japanese craft and design. It is an event and a platform devoted to sophisticated beauty grounded in tradition. Okay! We, Mimi Berlin Blogger Team, went to this Japanese event for the first time ever. We were stunned by so much traditional arts & crafts in one building. You must know; we have a complete different image of Japan in our minds: the colorful and tech-forward Japan. But we did spent a long time stroking the ‘Sugicodama’ cedarwood sculptures by Shimpei Arima; they were amazingly soft to the touch! Mono Japan can be visited through February 19, 2018 at the Lloyd hotel & cultural embassy, Oostelijke Handelskade 34 in Amsterdam. Yesterday we went to the opening of Fashion and the Sea at The Zuiderzee Museum. First we have to explain a bit about the Zuiderzee and it’s museum: The Zuiderzee Museum in Enkhuizen, The Netherlands, revives stories of people who once lived on the shores of the Zuiderzee. The Zuiderzee (means “southern sea” in Dutch) was a shallow bay of the North Sea in the northwest of the Netherlands. In the 20th century the majority of the Zuiderzee was closed off from the North Sea and the salt water inlet changed into a fresh water lake and polders (artificial land) Enhuizen is a old, pittoresque fisherman’s village, which is almost an open air museum itself. The museum invited ArtEZ Institute of the Arts, Arnhem to use its Zuiderzee heritage as a basis for new designs. First and second year students from the Department of Fashion Design designed outfits. Second and third year Creative Writing students wrote ballads for these designs: All using the Zuiderzee as inspiration source. The Curators of ArtEZ Fashion Design created a ‘flagship store’ with outfits, movies, crafts details and ballads. All this set around a large table made of the newspaper magazine ‘Fashion and The Sea’ -’Nets, Wind & Water’ which accompanies the exhibition. Used as a focal point, the table incorporates movies, inspirational pieces and design which demonstrate how students become designers within a period of four years. The “end result” of those 4 years is shown at the start of the exhibition. An overview of outfits, chosen from various final exam collections, which have something to do with sea, boats, water etc. The mannequins are set up high in the air, accompanied by a modern day ballad set to music and a film of waves, creating an almost catwalk like experience viewed from below sea level. We experienced this as a very poetical way of showing clothes, nice! 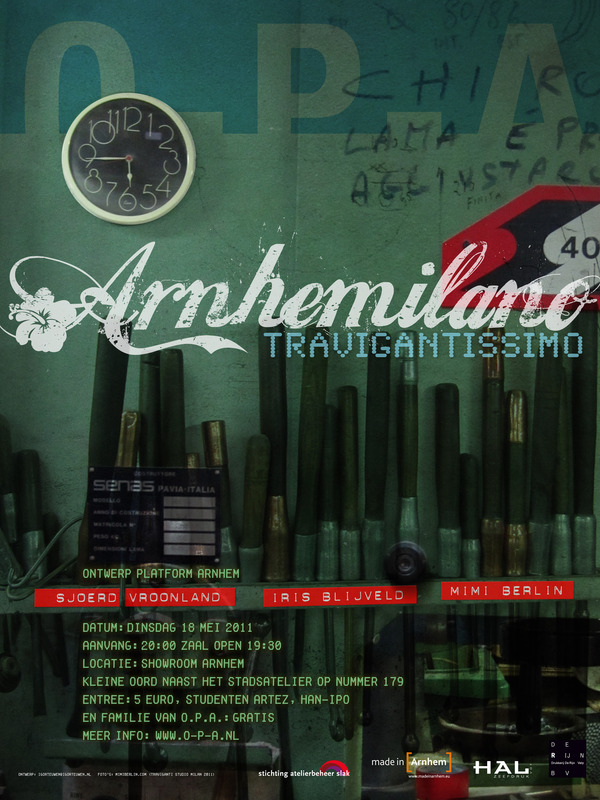 Travigantissimo: Tonight we have a presentation at O-P-A Arnhem.